It’s been really hot in Calgary and as a caffeine addict, this really puts a damper on my morning latte. Of course, brewing a latte and then adding ice is an option, but I always find this ends up tasting so watered down. Recently, Starbucks has been offering cold-brewed coffee in its shops, but I really don’t feel like paying $5 a cup when I know it’s something I can make myself. A friend of Stephen’s had been making his own, so I asked for the recipe. 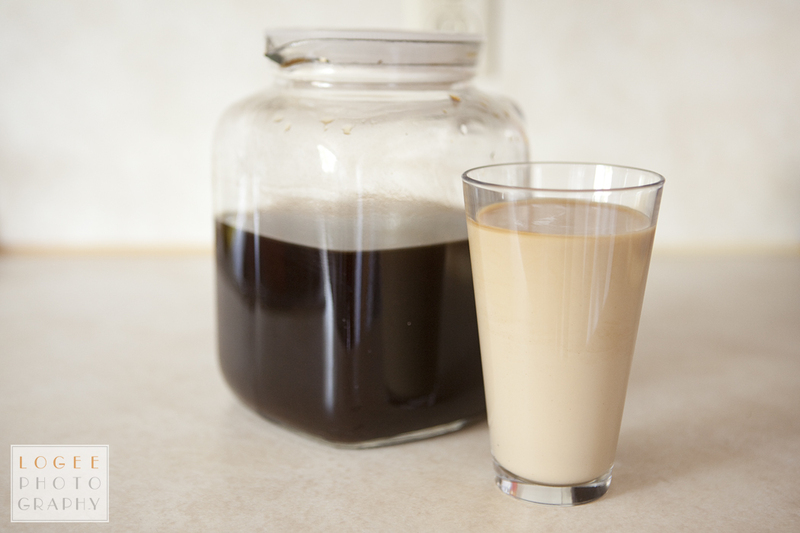 Fellow Calgarian blog Dinner with Julie has a great recipe for cold-brewed coffee that I’ve really been enjoying, so I thought I’d share & illustrate the process below. The greatest thing about this coffee is how smooth it is. Even dark-roast coffee has a smooth flavour, leaving the bitterness that comes from the boiling process behind. Step 1: Measure out 227 grams (1/2 pound) of coarse-ground coffee. Fine ground coffee will end up being really hard to process, so skip it for this recipe. I’ve had some fun making various coffee blends here. I really like a medium-bodied blend, but adding in a some scented coffee (like coconut, caramel, or french vanilla) can add an interesting flavour and sweetness without actually having to add any sugar. 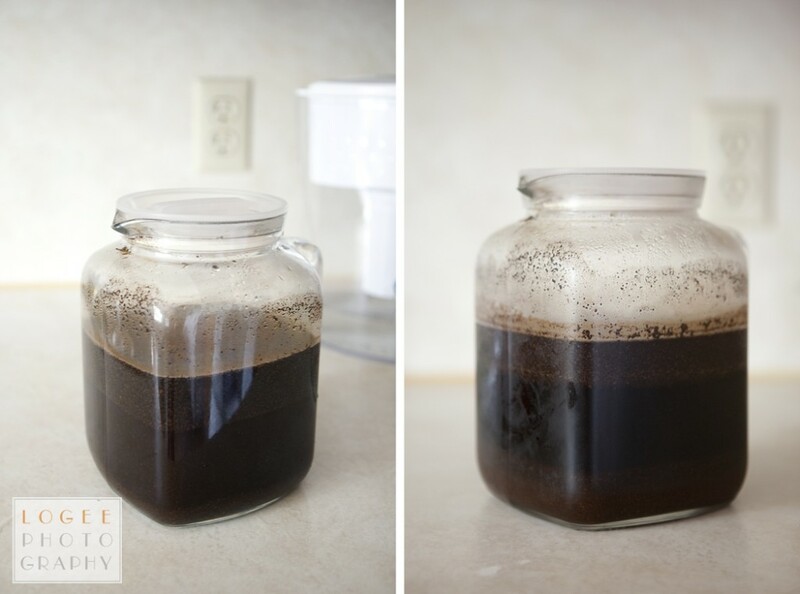 Step 2: Pour the coffee grounds into a large jar with 5 cups of cold water. You’ll keep seeing these jugs in my recipes, but I love the Bormioli 2.3L Glass Jug from London Drugs. They’re sturdy, come with a nice lid, and are just fabulous. Step 3: Stir the mixture and then let it steep in the fridge for 24 – 48 hours. The longer you steep for, the richer the flavour, but also the higher the caffeine content. If you’re looking for something really mild, 20 hours will work out well. As you can see in the photo above, the mixture will separate out a bit, which is handy for the next step. Step 4: Now it’s time to get rid of all the coffee grounds. If you’re careful when you take the jug out of the fridge, it will make it easier to get the grounds off. First, carefully skim off the grounds that floated to the top and put them through a permanent coffee filter in a bowl or large measuring cup. The first time I made this recipe, it was a horrible mess because I used regular paper filters. They were not able to handle the weight of the coffee grounds, and kept breaking open, leaving me to strain the mixture again. The metal coffee filter is great because you can add light pressure to extract even more of the liquid without having to worry about the filter breaking (within reason, of course). Once the top layer of grounds has been removed, it’s really easy to pour the rest of the mixture through the coffee filter. The original blog post recommends that you can pour it all through a paper filter afterwards, too, but I haven’t really found this to be necessary. I don’t mind a little bit of sediment in my coffee and it hasn’t been noticeable. The used grounds can be discarded, or added to the compost. Step 5: Measure out how much liquid you have and rinse out the jug. Pour the concentrate back into the jug and add an equal measure of filtered water to double the recipe. I usually end up with 3 cups of coffee concentrate, so once I add the water, the recipe ends up yielding 6 cups. Step 6: Drink up! Since I’m a fan of lattes, I like to add the coffee concentrate as a 1:1 with milk. You can also drink it straight, or with a splash of cream. I’ve personally been going through a jug of cold-brew a week. But I’m in a good place with my coffee consumption, so don’t judge me!